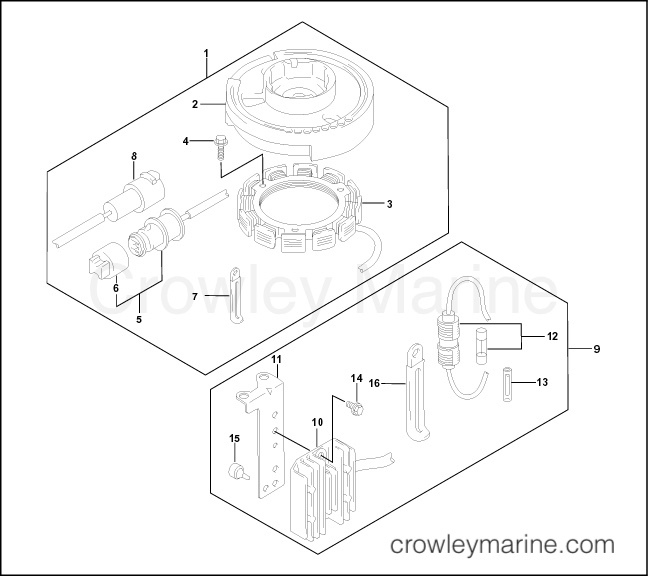 This kit is designed for use on 2003 and newer Johnson® 4 and 5 HP, 4-stroke outboards. DO NOT install on any other models. Regulated battery charging (or auxiliary lighting, if desired) is achieved with the addition of a lighting coil and a rectifier/regulator. A maximum output of 6 amperes can be obtained. 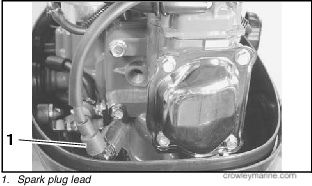 To prevent accidental starting while servicing, twist and remove spark plug lead. 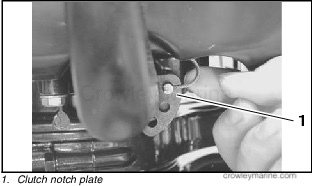 Loosen locknuts and remove starter lockout cable from bracket. Remove starter lockout cable from clutch notch plate. 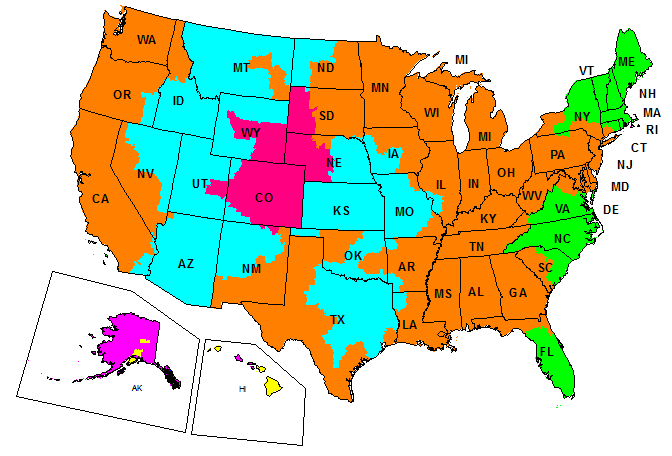 Gasoline is extremely flammable and highly explosive under certain conditions. Always work in a well ventilated area and wipe off any fuel spillage. DO NOT smoke and make certain no open flames or ignition sources exist. Unscrew fuel tank cap and detach cushion plate. 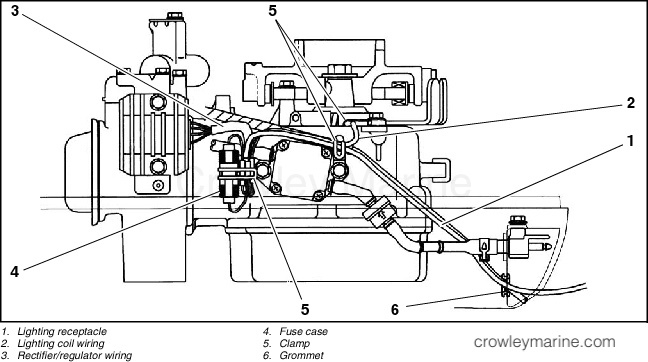 Loosen locknuts and remove starter lockout cable from manual starter. Remove three (3) bolts and manual starter assembly. Install cushion plate and fuel tank cap. 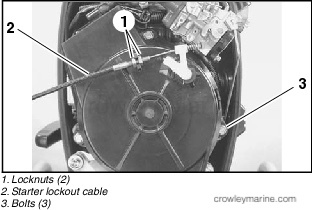 Remove two (2) bolts securing CDI and coil unit to powerhead. Remove CDI and coil unit. Disconnect Blue/Red lead wire from CDI and coil unit. Remove flywheel nut. Insert 1/2 inch breaker bar in rectangular slot to keep flywheel from turning. 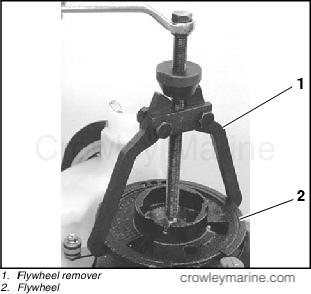 Use flywheel remover to remove flywheel from crankshaft. Apply Nut Lock™ to threads of two (2) rectifier/ regulator bolts and secure rectifier/regulator to bracket. Torque bolts to 71 in. lbs. (8 N·m). Insert cushion in bottom hole of bracket. Remove two (2) intake manifold mounting bolts and washers. 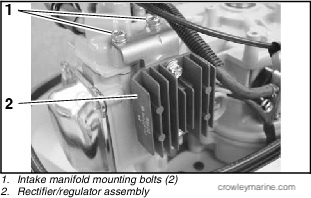 Secure rectifier/regulator assembly to intake manifold using two (2) washers and intake manifold mounting bolts. Torque bolts to 89 in. lbs. (10 N·m). Install lighting coil using three (3) bolts. 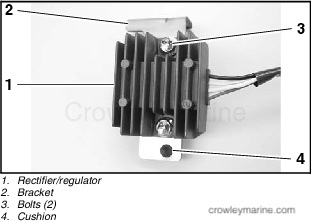 Make sure wiring is oriented to starboard side, as shown. Torque bolts to 89 in. lbs. (10 N·m). Install clamp to secure lighting coil wiring. 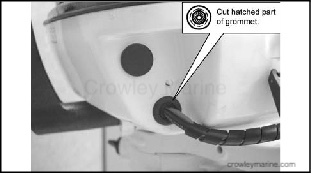 To accommodate additional wiring, opening in grommet must be widened by cutting away material from center of grommet. Route lighting receptacle through grommet. 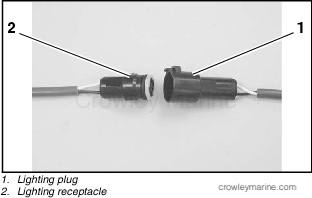 Install connectors on ends of both lighting receptacle lead wires. IMPORTANT: Make sure fuse is in fuse case. 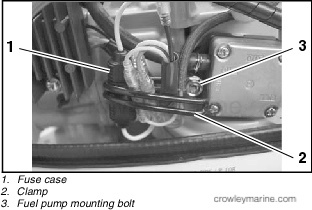 Install clamp under fuel pump mounting bolt. Torque bolt to 71 in. lbs. (8 N·m). Bend clamp over to secure fuse case and lead wires. 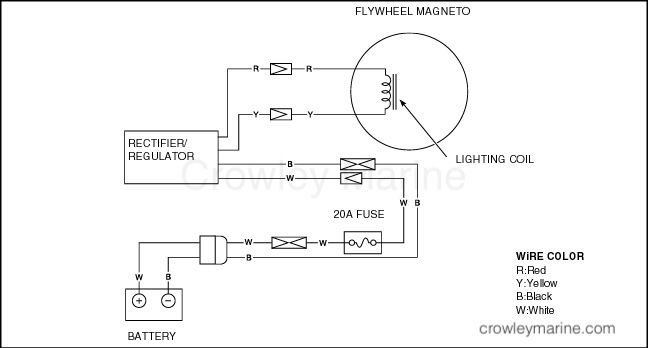 IMPORTANT: Flywheel, P/N 5034736, is specially machined on inside rim to function properly with lighting coil. DO NOT use original flywheel. Make sure key is installed on crankshaft. Install new flywheel included with kit. 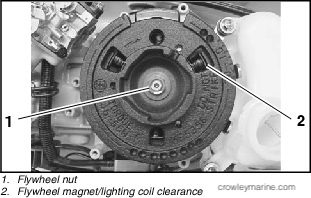 Use holes in flywheel to visually check for clearance between flywheel magnets and lighting coil. Torque flywheel nut to 36 ft. lbs. (50 N·m). Connect Blue/Red lead wire to CDI and coil unit. Install ground wire under bolt. Install CDI and coil unit. Tighten two (2) bolts finger tight. 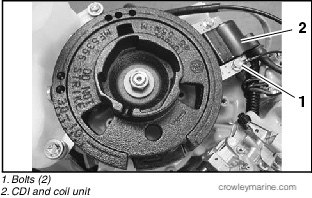 Use thickness gauge to verify air gap of 0.02 in (0.5 mm) between each core end of CDI and coil unit and machined part of flywheel. Torque bolts to 89 in. lbs. (10 N·m). 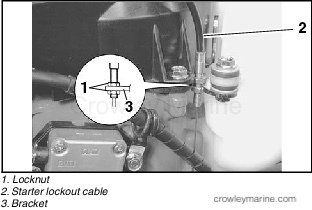 If starter lockout cable is removed or not adjusted correctly, there is a risk of losing one’s balance or being thrown overboard if outboard starts in gear. 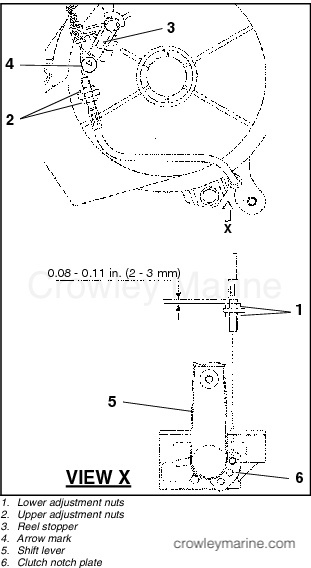 Adjust lower adjustment nuts to achieve dimension indicated in diagram. Tighten nuts. 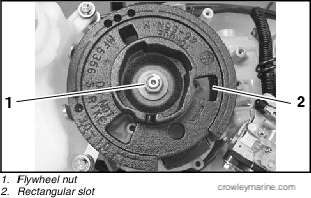 Adjust upper adjustment nuts so center of reel stopper is aligned with arrow mark on manual starter assembly cover. Tighten nuts. Pull rope to make sure starter does not function when shift lever is in Forward or Reverse. 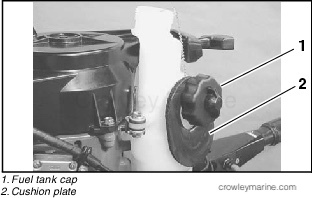 Apply Triple-Guard® grease to reel stopper, clutch notch plate, and both ends of inner cable. Secure all batteries in protected locations. 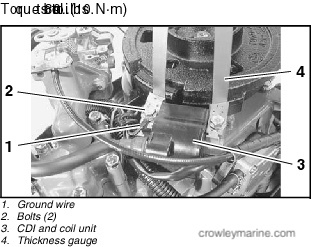 Position battery as close to outboard as possible. 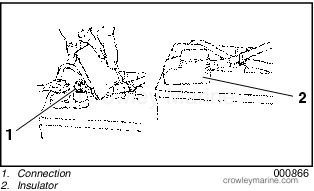 Battery location must provide access for periodic maintenance. Use battery mounting trays or battery boxes on all battery installations. Connections and terminals must be insulated. 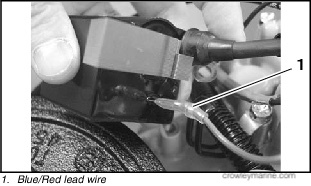 Battery connections must be clean and free from corrosion. Apply Triple-Guard grease to prevent connections from corroding. Read and understand safety information supplied with battery before beginning installation. Keep the battery connections clean, tight, and insulated to prevent shorting or arcing and causing an explosion. If the battery mounting system does not cover the connections, install protective covers. Check often to see that connections stay clean and tight. IMPORTANT: Do not use wing nuts to fasten ANY battery cables. 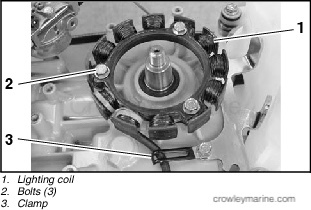 Wing nuts can loosen and cause electrical system damage not covered under warranty. Connect white wire of lighting plug to positive (+) battery terminal. 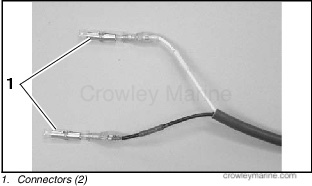 Then connect black wire to negative (-) battery terminal. Remove cap from lighting receptacle. Connect lighting plug to lighting receptacle.